As well as "higher levels" of functioning. Being subtle matter, however, attempts at either changing or training our minds are diluted by the nefarious condition of the atmosphere that surrounds us and which many incorrectly assume we are powerless to control. By negative effects of atmosphere existing today, included are: atmospheric pollution, air pollution, water pollution, acid rain, as well as many other conditions commonly associated with Global Warming. 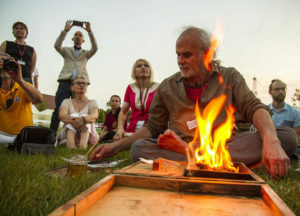 As Homa Therapy, bio-energetic manipulation of atmosphere through the agency of fire, improves functioning of not only atmosphere in general but our minds in particular, we are employing processes that not only are highly efficient, but which have the potential to 1) upgrade existing healing modalities and 2) become a modem of healing of and in itself. Our therapists and healing practitioners employ Homa Therapy in their practices. Hence, they are able to share their accumulated experience and knowledge as well as pass it on so that clients ultimately become proficient and independent. This distinguishes what we do from the “planned obsolescence” and dependence encouraged by the preponderance of other therapists and therapies. Our goal is short-term therapy through which clients are given the tools to become independent and able to function at high levels of efficiency and happiness REGARDLESS OF PAST TRAUMAS. What we offer needs to be experienced to be believed! Some of our services are offered free of charge as a badly needed public service.